The Route des Grandes Alpes (Great Alpine Road) is a 700 km long route through the French Alps. 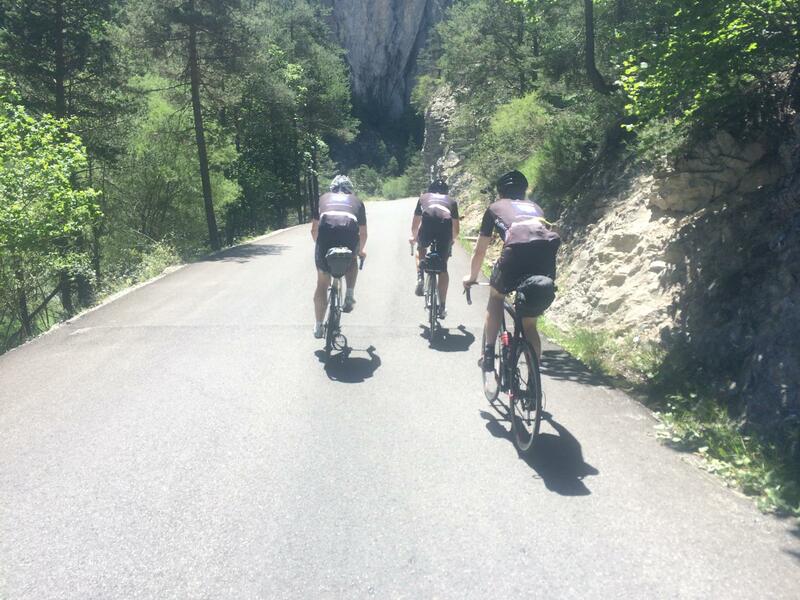 Four members of the Shutt Velo Rapide Racing Team spent a week following the historic Route des Grandes Alpes through the high mountains of France from Lake Geneva to the French Riviera. Justin Belcher takes us through the ride. 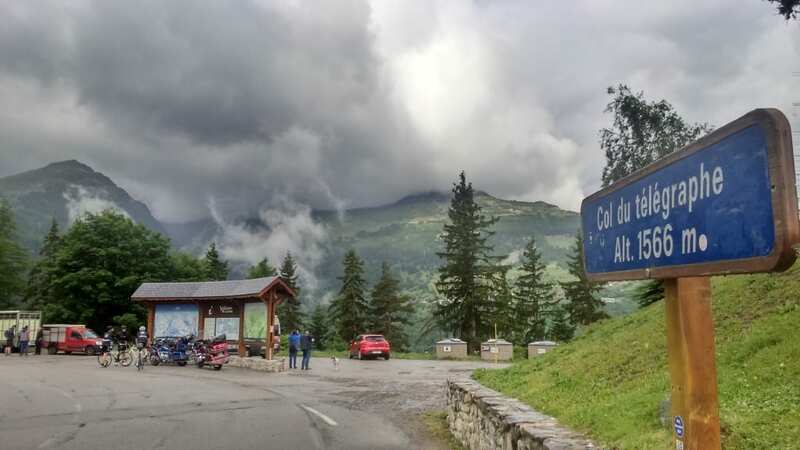 The Route des Grandes Alpes (Great Alpine Road) is a 700 km long route through the French Alps devised by the French Touring Club and constructed between 1909 and 1937. It runs from Lake Geneva to Menton on the Mediterranean and includes some of the highest and most beautiful mountain passes in Europe. The route takes in 16 of the French Alps’ highest passes: Col des Gets (1,170 m), Col de la Colombière (1,613 m), Col des Aravis (1,486 m), Col des Saisies (1,650 m), Col de Méraillet (1,605 m), Cormet de Roselend (1,968 m), Col de l’Iseran (2,770 m), Col du Télégraphe (1,566 m), Col du Galibier (2,645 m), Col d’Izoard (2,360 m), Col de Vars (2,108 m), Col de la Cayolle (2,326 m), Col de la Couillole (1,678 m), Col Saint-Martin (1,500 m), Col de Turini (1,604 m) and the Col de Castillon (728 m). Geneva proved to be reasonably easy to navigate and we were soon on the fairly quiet roads that follow the southern shoreline of Lac Leman. We made good progress leaving Switzerland into France, stopping just after the border for food in a village where a local rock band was setting up for the evening. Thonon was very busy with live music playing in most of its many squares. I’m guessing there was some sort of festival on. I don’t imagine it’s this lively every Saturday. First day of the ride proper. We had a good breakfast in the hotel and went into town in search of the plaque which commemorates the start of the Route des Alpes. It was easy to find because around 100 riders were already there, complete with a film crew, support vehicles, and photographers. They were riding the 2015 Cyclo des Grandes Alpes which navigates the route to Menton (and back again). The Col de la Colombière (1,613 m) was probably the toughest climb of the day. It was decidedly hot in the sunshine and I was soaked with sweat at the summit. A cola flavor Calippo ice lolly went down well with my coffee. We were passed a few times today by a convoy of classic cars and they stopped in the same café as us on the Col des Saisies (1,650 m). Plaques on their cars said they were doing the Route des Alpes this week too. They were drinking beer at most of their café stops. We found ourselves a reasonable hotel in Beaufort, showered, changed, enjoyed a couple of beers, before heading into town for supper. The meal was fine, but one of the problems with touring in the mountains is that restaurant portions aren’t always adequate for hungry cyclists, so we followed up dinner with extra chips from an outdoor bar. The chips came with beer. The first two hills of the day (Col de Méraillet (1,605 m) and Cormet de Roselend (1,968 m)) are pretty much the same climb. From the top of Méraillet there’s a short descent around the Roselend Lake before the relatively short climb to the summit of the Cormet begins. The Col de Méraillet takes a picturesque route through forests and the view across the lake is stunning. 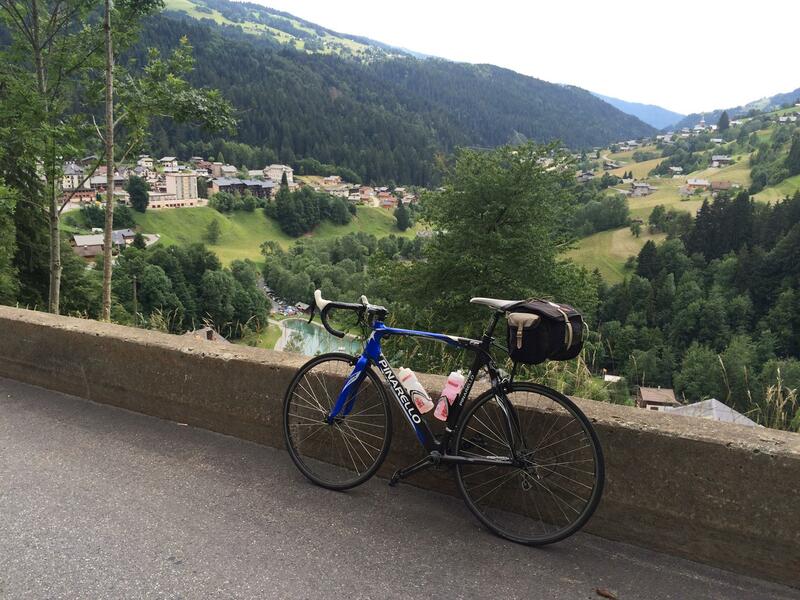 The Cormet de Roselend took us above the tree line and has an amazing descent to Bourg Saint Maurice. At 2,770 m, the Col de l’Iseran is the highest point we reach on this tour, in fact, it’s officially the highest pass in the Alps*. It connects the valley of the Isère and the valley of the Arc River between Val-d’Isère in the north and Bonneval-sur-Arc. Before tackling the climb, we stopped in the ski resort of Val-d’Isère for lunch, which turned out to be more difficult than we thought. Almost everything was closed. We eventually found a restaurant that was open and paid too much money for not enough food. It was better than nothing though. The Col de l’Iseran is a nice ride with plenty of stunning views and quite a lot of snow around near the top. The ride down the Maurienne valley to Modane was tough with a strong headwind and having found a hotel we sank a few beers before heading up to the rooms to shower and change. Dinner was in a local pizza restaurant where we munched our way through a full three courses. Starting from Saint Michel de Maurienne, the Col du Télégraphe (1,566 m) ascent is 12 km long with 14 hairpins and a vertical gain of 856 m. It’s a nice climb with plenty of tree cover to shade you when it’s sunny. That didn’t matter today. This was my fifth time up this side of Télégraphe and it took us just under an hour. In Valloire, we stopped in a bar for coffee and snacks. Next up was the Galibier, one of the supercols from the Tour de France. 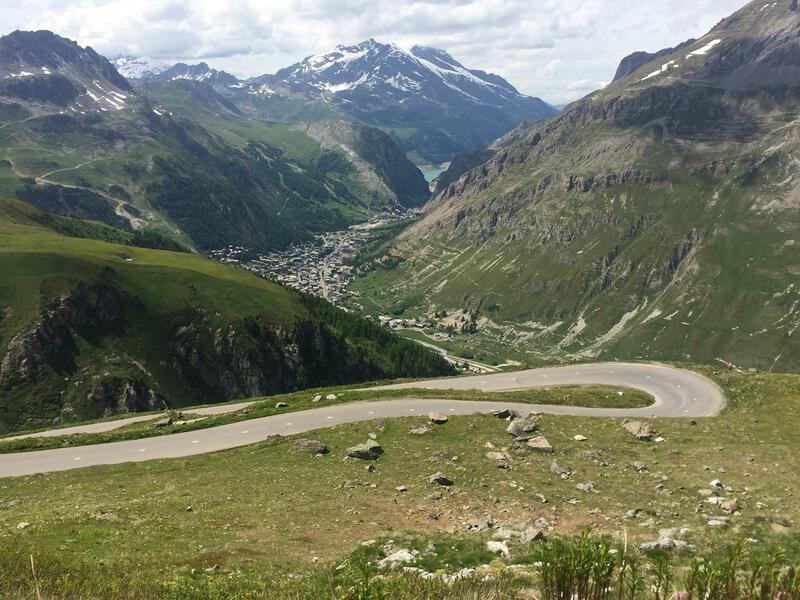 Starting from Valloire, the Col du Galibier is 18 km long to its summit at 2,645 m. The maximum gradient is 12%. The wet weather made the climb easier, it was certainly easier than I remember it from the Marmotte, but the descent was murder in the cold. We bought some lunch in an E.Leclerc supermarket and stuffed our faces in its foyer before heading to the 19 km long Col d’Izoard (2,360 m). This was a tough climb. The weather had improved so it was hot again and the flies were out in force. The Col d’Izoard has some long steep straight sections that are psychologically tough and climbs over 1,300 m from Briancon to its summit at 2,344 m. The decent to Guillestre is a real treat though, very fast, with a nice gorge to enjoy. Guillestre is a fantastic little town. It only has two hotels and the first we tried was full. Fortunately, the second hotel was enormous and we had nice rooms with balconies overlooking the mountains. The Col de Vars (2,108 m) from Guillestre was a pleasure to ride up and the last of the climbs I’ve done on previous trips. The Vars ski stations are attractive villages and the views back towards the high Alps are spectacular. We were held up by a serious accident on the descent. A motorcyclist had hit a car in a tunnel. The emergency services were there in force including an air ambulance. It looked pretty bad. The road was closed and we felt awful pushing our bikes past the scene, but there was space and we wouldn’t have achieved anything by waiting. The experience slowed us down on the rest of the day’s descents, we all felt quite mortal. We bought lunch in a supermarket in the market town of Barcelonette which we ate in one of the town’s many squares. Barcelonette is a vibrant little community with shops and a street market. It looked like it would have been a good place to stay had it not been lunchtime. The early part of the Col de la Cayolle takes you through a steep-sided gorge before climbing through fields to its summit at 2,326 m. We saw our first celebrity of the trip here, Oleg Tinkov, the owner and main sponsor of the Tinkoff-Saxo pro cycling team. 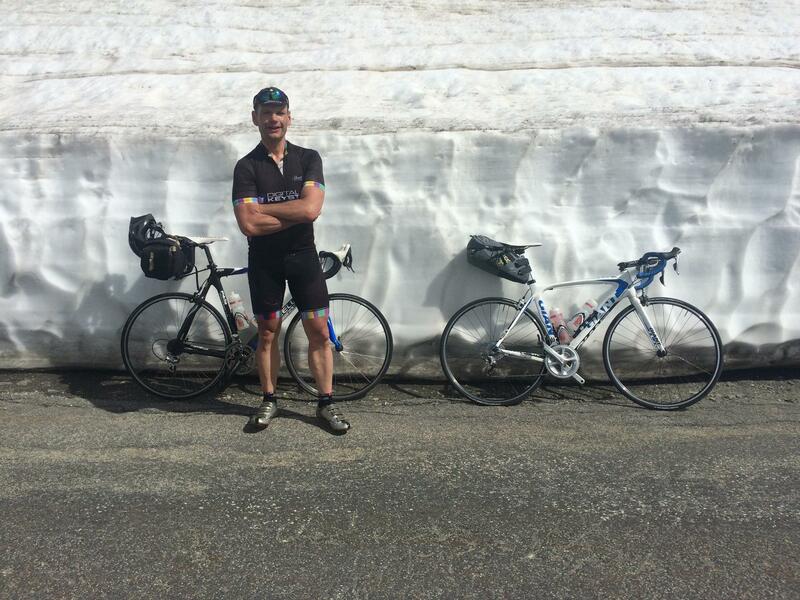 He was riding down the col towards Barcelonette. The descent is one of the most famous balcony roads in the Alps. Balcony roads are the ones cut into the sides of sheer cliffs – not much fun for people with a fear of heights, but they’re great for photographs. We took a turn signposted to Valberg (1,430 m) which took us up a quiet climb through forests. We stopped in a reasonable sized town called Péone for refreshments before continuing the climb. It was blisteringly hot on the lower slopes and I started to suffer from the dreaded hot-foot. I poured water from my bidons on my shoes to try and cool my feet. The road to Valberg was very quiet and we can’t have seen more than two cars in the space of an hour. I began to wonder whether there was going to be anything up there when we arrived. Just realised why I started this paragraph the way I did. The turn we took to Valberg wasn’t part of the official route, we should’ve taken the next turning. The route we took was probably better through, almost traffic free. Valberg is a purpose built ski station and although it does have a short summer season in July and August it was almost deserted in June. Almost all of the restaurants and bars were closed as was the local supermarket. Encouraged by a sign saying “Ouvrir tout l’année” we tried a pizza restaurant only to find this was closed too. The busiest place in town appeared to be a hotel called Le Chalet Suisse where the convoy of classic cars that had been shadowing us were parked outside. The hotel’s restaurant was fairly busy and the atmosphere buzzing. We ate well. Last day of the Route des Grande Alpes and on paper the easiest with a net altitude drop from Valberg at 1,500 m to the Mediterranean at, sea level. The Col de la Couillole (1,678 m) was a fairly easy climb because we started so close to the top, and the descent was absolutely amazing with around 16 km of winding hairpins through forests and cliffside roads. The views were out of this world. The combination of lower altitudes and the fact that we’re now much further south meant that it was hotter than ever today. This made climbing the hills much harder. I found the Col de Turini (1,604 m) particularly tricky. This pass is famous for a stage of the Monte Carlo Rally and there were lots of photos of the race in the café on the summit. Then it was all downhill to Menton, almost. 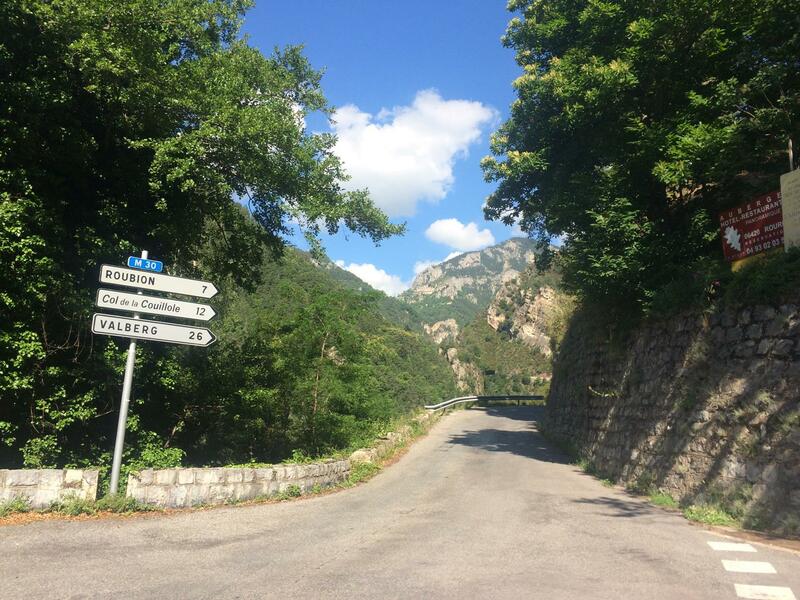 We descended to Sospel, a very picturesque town and gateway to the Alps from the Med before heading over to what was signposted Le col de Castillon towards Menton. It turns out we were on the cars only version of the pass which took us via a tunnel through which bikes were not allowed. We went through it anyway. Once in Menton we checked into an adequate hotel and hit the town in search of dinner. Menton is a lovely little town on the French-Italian border, on the edge of a bay between Monaco and the Italian Riviera. The tourist brochures claim that there’s sunshine here 331 days of the year and no mosquitoes. Seems no-one told the mozzies this though as I had a bite on my knee, one of my shin, and another on my thumb. My Strava data says that, despite the net drop in altitude, we did more climbing today than on any of the previous days. I can believe it. Established in 2009 during a ride in the Yorkshire Dales between two avid cyclists, Shutt Velo Rapide began with a simple mission; to create a well-designed, high quality brand of cycling garments using modern fabrics that offer accessible performance. The company headquarters has since moved to Oxfordshire. Everyone at Shutt is still as passionate as we were back then; continuing to stay true to our core values of authentic craftsmanship fused with clever technical solutions. We strive to give our customers a reason to come back time and time again to our small and personable business. All our products are designed in Great Britain. Many of our jersey ranges are handmade in Leicestershire. Our other products are made by hand by specially selected partners in Italy, Portugal and Czechia. We have the unique privilege of being involved in every aspect of the production process allowing us to continually improve and develop our product range regardless of the season. Everyone at Shutt is involved in grass roots cycling: we race, we ride audax, we commute, we cycle tour. So we understand that the hours spent on the bike have to be as comfortable as possible – it helps if you look good too! Our range really is tailored for the road and fits the needs of all cyclists – young, old, male or female, the average rider, sportive racer or out and out professional. * There remains some debate around which is the highest pass in Europe, but I’m going with the Col de l’Iseran. 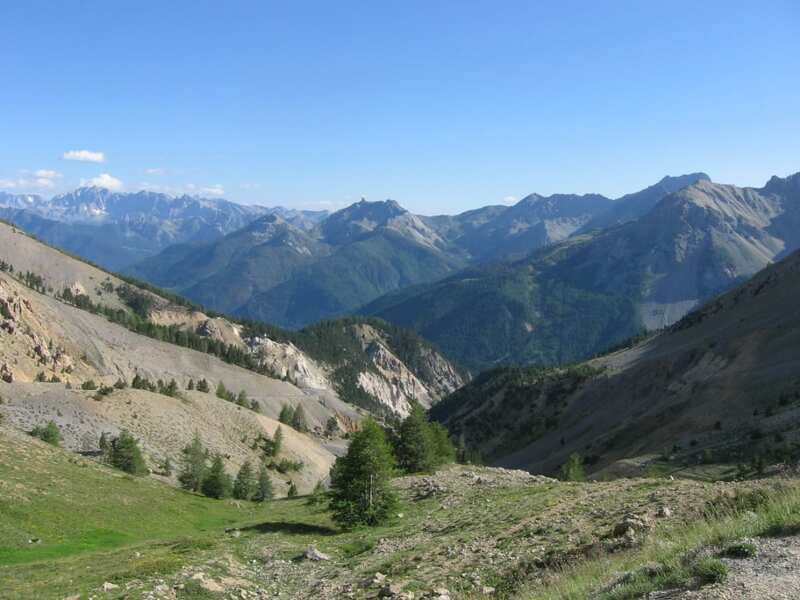 The road around the Cime de la Bonette reaches an altitude of 2,802 m, but this is not a “pass”, but merely a scenic loop. It is, however, the highest asphalted road in France and is the highest through road in Europe. The actual Col de la Bonette rises to 2,715 m so there are three Alpine road passes whose altitudes are higher: Col de l’Iseran (2,770 m), Stelvio Pass (2,757 m) and Col Agnel (2,744 m). The highest paved road in Europe is the access road to Veleta in the Sierra Nevada, Spain which reaches 3,392 m, but it is not a through road (or a pass).